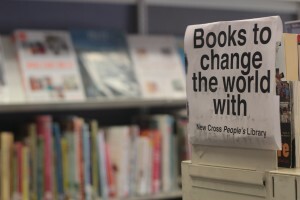 I’ve been reading about the brilliant People’s Library at New Cross on the RSA blogs courtesy of Sam Thomas. On the face of it, this is a Big Society triumph. In the face of swingeing public funding cuts of £88 million, 5 libraries in Lewisham faced closure. Funded by no more than £2,000 from the RSA’s catalyst seed fund, RSA fellow Catherine Sholvin, with the support of local charity Bold Vision, have established a volunteer run library. From the video and the report, Catherine and her team have done more than keep the library going – they’ve transformed the space into something more communal, convivial, and welcoming. Two things stand out here. Firstly, this brings to mind my earlier thoughts about the wonder of low-tech social innovation. The People’s Library has not been constructed with the latest digital architectures and does not boast a shiny metal edifice. There is a global rush to champion digital social innovation but that isn’t always the most appropriate solution; people-centred, low-tech social innovation can often deliver more and a lower financial cost. In austere times where public and private investment is restrained, low-tech social innovations might be the order of the day. Secondly, low-tech social innovation is potentially easier to replicate. This is not always the case, since they sometimes depend upon charismatic leadership, but it could be that the organisational and operational structures can be modelled and replicated without the acquisition of expensive digital equipment (or staff to operate and train others on it). One of my interests is in the enabling conditions for urban innovation and it is clear that finance and digital environments vary significantly within and across regions of the UK. There’s no been shortage of commentators lining up to condemn Britain to the bleak wastelands of a lost decade. I’d prefer to avoid such grim fatalism. A nationwide chain of People’s Libraries might not generate jobs, but they could provide the services which could catalyse economic growth, enable learning, enhance civil engagement and, perhaps just as importantly, raise spirits. You don’t have to parrot Big Society platitudes to celebrate small victories like this.